How're You? Kids in the kitchen | How're You? At age eight, my daughter can confidently scramble her own eggs, flip pancakes, and slice strawberries and melon for the accompanying fruit salad. These skills come in handy for breakfast in bed on Mother’s Day! From a young age, I’ve involved both of my children in an array of kitchen duties, and as their self-esteem and age continue to advance, so do their cooking skills. Pure glee abounds when they make a perfect peanut butter sandwich or properly measure the right ratio of oil to vinegar in salad dressing. The kitchen becomes an expansion of the school room, since cooking teaches lessons in science, language, math, budgeting, problem-solving and reading. And culinary diversity –from Greek salad to Indian lentil daal to Mexican guacamole — is a great lesson in geography too! Hands-on experience for kids in the kitchen is especially enriching when you cook with real ingredients instead of processed foods. This exposure helps children them develop a more mature palate, takes away the fear of new foods, makes it easier to eat in restaurants (no more buttered noodles!) and gets their taste buds used to nutritious food, so they’re less likely to acquire a taste for highly processed foods. 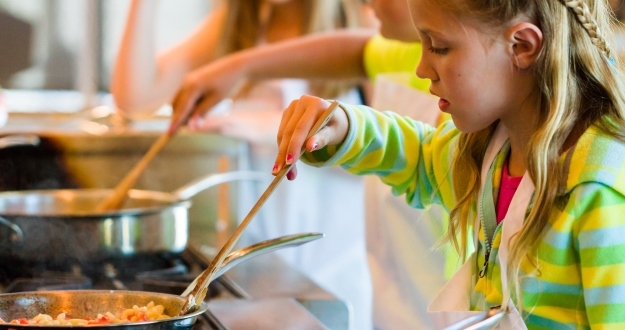 If you’re not a home cook, consider enrolling your kids in a cooking class. A review study showed that kids taking cooking classes eat more vegetables, get more fibre and have a greater willingness to try new foods (great for picky eaters!). Spending time in the kitchen lets kids feel accomplished, which is a great way to boost self-esteem and teach responsibility. And it teaches them a life-long skill that they can continue to build on as they grow.